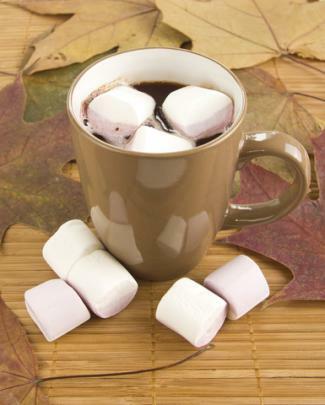 Marshmallows are a soft, sugary candy that have been around for centuries. They're readily available in grocery stores, but you might want to consider making them from scratch either to eat or to use in a recipe. Homemade marshmallows are so mellow and delicious that you might never buy another bag from the store once you taste them. Making your own isn't much more difficult than whipping up a batch of brownies, and after you make your first batch, you can experiment with different flavorings, food colorings and coatings to create your own gourmet version of this well-loved treat. Pour 1/2 cup cold water in a large metal bowl, sprinkle the gelatin on top and set aside. Combine the sugar, corn syrup, salt and 1/2 cup water in a heavy saucepan. Bring the contents to a boil while stirring occasionally. Once the mixture begins to boil, allow it to cook without stirring until it reaches 240° F.
Remove the pan from the heat, and slowly add the mixture to the gelatin. Beat on high until the volume doubles, and then beat in the vanilla. The mix will be very sticky. Use a wet spatula to spread the mixture into a 13 x 9 x 2-inch baking pan lined with parchment paper that's heavily dusted with powdered sugar. Dust the top well with sifted powdered sugar, and let the mix set up at room temperature for approximately 10 to 12 hours. Lift the marshmallow out of the pan by the paper and set it on a cutting board. Cut into squares of any size you desire by using a dough cutter coated in cooking spray. Dip each square into sifted powdered sugar to coat the remaining sticky sides. Alternatively, you can substitute cocoa powder or a mixture of cinnamon and powdered sugar for a fun change in flavor. The root of the marshmallow plant, althea officinalis (commonly found in salt marshes and swamps), was used to thicken honey-based treats in ancient Egypt, but modern recipes typically use gelatin as a stabilizer. In 1948, Alex Doumak patented an extrusion process, and marshmallows are now made as a long tube, cut into sections, and rolled in a fine powder of cornstarch and powdered sugar. You can roast marshmallows around the campfire or makes s'mores. They are delicious melted in hot chocolate or over sweet potatoes, and even better when you turn them into cereal treats. You can even make marshmallow filling to spread between layers of cake. Blend marshmallow fluff with cream cheese and a little vanilla, and you have a luscious dip for fresh fruits. 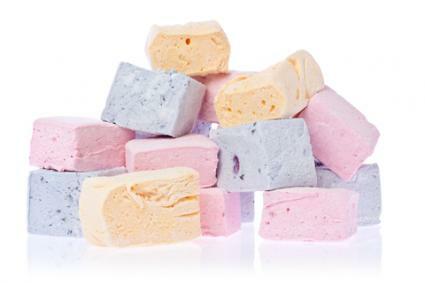 While marshmallows do contain high amounts of sugar and aren't typically suitable for diabetics, they are a low-fat or fat-free food (depending on the manufacturer) and supply plenty of carbohydrates. They have little other nutritional value, however, so enjoy them sparingly.